Few weeks ago, a friend said he would like to explore mongo collections within the IDE with a user experience similar to Firebug (Tree with navigation through the objects). 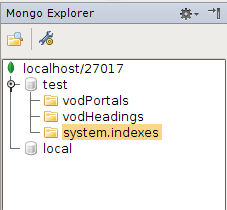 No mongo plugin for Jetbrains products has existed until now, so I decided to create mongo4idea. There is a panel which display all databases and collections. When the user double-click on a collection, he can get all values in another panel in a tree view. The data formatting looks like Firebug . You can specify some filter or more advanced such as aggregate. The plugin is not officialy released on the Jetbrains repo yet. A Snapshot is available on the github project for trying. Note : This plugin only supports IntelliJ 11.1.4.